I’ve visited the DeLoach vineyard, located in the Russian River Valley of Sonoma, California. Typical of the Russian River Valley, this winery creates some primo Pinot Noirs, and with a price tag to match. 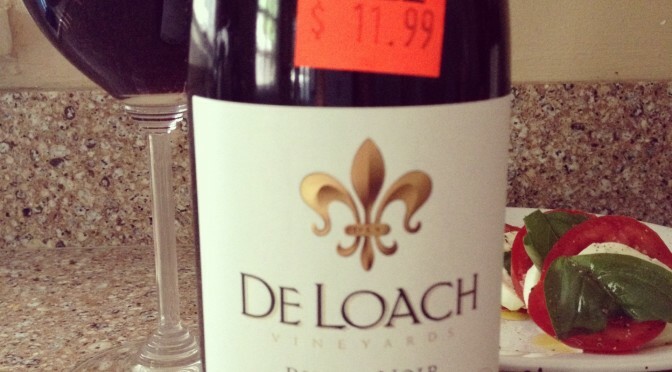 So, when I saw a DeLoach Pinot Noir on sale for $11.99, I thought I’d give it a go. Now, a $12 price for Pinot is a bit like seeing a new Mercedes for $4000. However, with the DeLoach name on the bottle, I figured it wouldn’t be entirely useless swill. Now, this isn’t a $40+ bottle of Pinot Noir. It just isn’t as refined as others. In fact, you could say it’s a little rough around the edges. But that’s OK, because sometimes we like it a little rough. Until then, I think this DeLoach Pinot at $12 and change is a great value. The grittier, rougher Pinots may just excite you in a way you never thought it could. It may not rock your world, but it also won’t rock your wallet like one quadruple its price. Fine. I don't have any sommelier badges. But I have drunk a lot of wine. A lot. And though I’ve swirled my share of Chateau Valandraud Saint-Emilion, the bottles I buy are almost always under fifteen bucks. Because I'm not made of money. So now I invite you to benefit from my tireless field work in the sodden trenches of great wine. Copyright © 2011-2014 The Savvy Lush, L.L.C. All Rights Reserved.